The opening in 1899 of a consulate in Tengyueh (also known as Momein), close to the Burmese border and a six week journey from Shanghai, stemmed from an Anglo-Chinese convention of 1894 about Burma. The consul lived at first in a tumbledown granary and then in an old yamen: half the costs of running the consulate were met by the Indian government. Boyce recorded in 1899 that it would be difficult and expensive to build there. A site for a new consulate was nonetheless acquired in J Pao Street, just outside the walls and close to a site for the Customs, in 1903, an adjacent site in 1904, and eight further plots were bought freehold in 1910 from various owners. Thus was a site of 9½ acres consolidated for eventual consulate buildings. Activity, however, remained at a low level and it was not until the 1920s that construction started on consular buildings, which were completed in 1930. They were badly damaged during the war and abandoned in 1942. 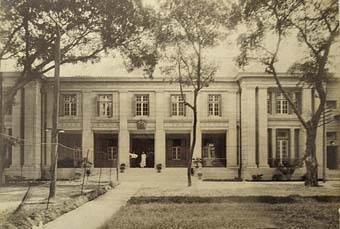 The consulate at Nanking was gutted in March 1927 when the city was taken by the Kuomintang, and was for a short while afterwards used as a hospital. Restoration works were completed the following year, for which the Nationalist government paid full compensation. Nanking became the Kuomintang capital in 1928, and for the next seven years the consulate played frequent host to the ambassador and staff visiting from Peking. Two temporary bungalows were put up for cipher and clerical staff in 1929. The consul-general’s residence was adapted to become the ambassador’s residence in 1936 when the embassy moved to Nanking, and the consul-general moved to the (extended) vice-consul’s house at the same time. The Chinese Air Force occupied the compound during the Japanese war. The embassy returned to Nanking in 1945 and stayed until 1950. The buildings at Tengyueh and Harbin were the last to be constructed anew at any British consulate in China but they were roughly concurrent with late building works at the two oldest and largest consulates, Canton and Shanghai. 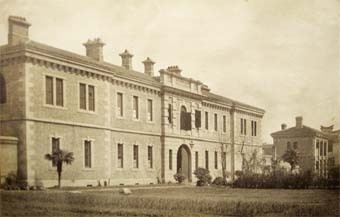 The 1860s Shameen buildings at Canton were severely damaged by floods in 1915, and the residence for the consul, by then upgraded to consul-general, was rebuilt in 1921. The assistants’ quarters collapsed during a typhoon in 1921 and were reprovided as two flats above the offices in a new building that was completed in 1924. William Roberts, the Office of Works architect in Shanghai, designed a new vice-consul’s house on which site progress was interrupted in June 1925 by boycotts and strikes so that it was not completed until 1927. By 1928, therefore, practically the whole compound had been rebuilt. Not, in fact, wholly successfully because the roof of the consul-general’s house was dangerously close to collapse by the late 1930s and needed extensive works. The Canton concession area was returned to Chinese administration in 1943. A great deal of damage was done to the consulate buildings in January 1948 when rioters looted and burned the compound. The houses were repaired within a few months but the offices had to move into leased premises nearby, at 18 Fook Hing Road, for most of the eighteen months or so that it took to rebuild the office building, substituting offices for the flats on the first floor. The titles to the Canton properties were exchanged for perpetual leases in 1951. The post closed in 1953. 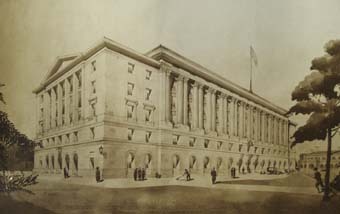 In twentieth century Shanghai, two houses were built for Office of Works surveyors in 1902; some land was leased to the Shanghai Rowing Club in 1903; other land was leased to the Council for the Foreign Community from 1909; two small extensions were added to the west front of the Supreme Court to house new courtrooms and offices in 1913; and a building was put up for Naval Intelligence Branch in 1923. 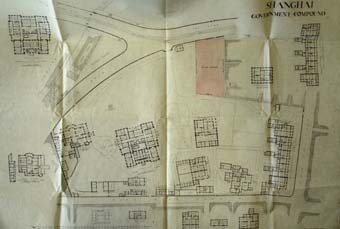 The architect William Roberts, was tasked in about 1920 with producing proposals for developing the compound, particularly with UK staff residential units, possibly to be funded by the sale of part of the compound. Roberts went through several versions in the next three years, each larger and less realistic than the last, but the political scene was worsening, there was no real pressure behind the scheme, and the Tokyo earthquake of 1923 took over all his attention. The Shanghai consulate was the last British consulate in China to close: it did so in1958 and the British vacated the compound in 1967. The dismantlement of the concession areas began with an agreement with the Chinese government in 1927 that paved the way for the rendition of extra-territoriality. The concession areas at Hankow and Kiukiang were the first to be handed over to Chinese administration the following year. In 1943, Britain surrendered the entirety of its remaining extra-territorial rights in a Treaty of Relinquishment. The disposal of the consulate sites and buildings took another thirty years. Vacant consulate buildings had for long been variously disposed of: leased to tenants or missionaries, handed over to the Salt Administration or the Imperial Customs, requisitioned by local or national authorities, damaged by war or riot beyond re-occupation, and a few of them sold. Several consulates were still open in 1949 when the communist People’s Republic of China was proclaimed, with the capital at Peking. The new regime soon required the registration of all foreign-held property, which caused a great deal of chasing after documents in Peking and London. It became clear how much miscellaneous consular property there was scattered across China: some of it was pretty well forgotten, even though the Ministry of Works (which had succeeded the Office of Works in 1942) was still paying the wages of caretakers at thirteen of the consulates. It was clearly sensible to comply with registering the properties so as to be able to dispose of them, even though registration meant that taxes became payable. Thanks, however, to meticulous past record-keeping in most consulates, and also in the Office of Works’ office in Shanghai, and the efficiency of the Chinese bureaucratic machine, the property registration process was completed, except for the Peking legation compound, during 1950 with remarkably little pain. By working backwards from tax demands, the Ministry of Works calculated that its total holding in China might be worth about £3.5 million, even if sold to the Chinese authorities. The disposal process, starting with the ruins at Changsha in 1952, was erratic and prolonged, and continued into the 1970s. British consular representation in China was confined to Beijing between 1958 and 1985. In the latter year, a British consulate-general was re-established in Shanghai, not in the old compound which by then had an entirely different life of its own, but in more modern surroundings far better suited to today’s diplomatic and consular activities. Consulates-general have also now re-opened in Guangzhou and Chongqing. The nineteenth century consulate era belongs to history. Some of its buildings remain standing and in new uses, especially as museums, and a few are in course of restoration: evidence of others still exists on the ground. Many have entirely disappeared. A more detailed compendium of their fates remains to be researched. 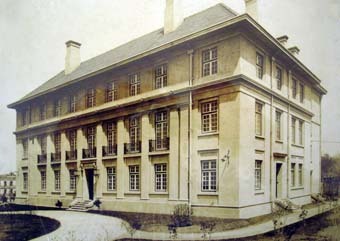 The consulate building at Harbin, completed in 1930. The arrangement of the Canton consulate compound in about 1930. The offices were on the ground floor of the north building, with assistants’ quarters above; the consul-general’s residence was towards the SW corner; the consul’s towards the SE corner: and constable’s and servants’ quarters arrayed around much of the periphery. In the middle was a large lawn. The entrance and main facade of the Canton offices, seen from Central Avenue in about 1930. 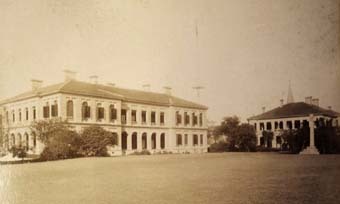 The consulate and Supreme Court offices building and the consul-general’s residence at Shanghai in about 1910. The terrace of consular houses at Shanghai, seen from Peking Road. 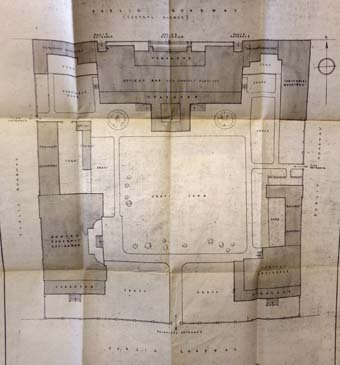 A 1923 proposal by the architect, William Roberts, for the re-building of the Shanghai compound. It was never pursued.